where Jews sought shelter under Roman rule. 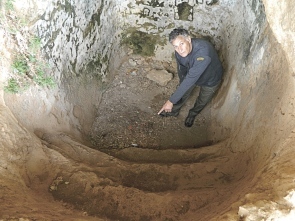 "The discovery of mikvehs in archaeological excavations is always a sign of Jewish life," said Shivtiel, a lecturer at the Zefat Academic College and Ohalo College who will be presenting his findings at a conference at Tel-Hai College next week. "The Mishna reinforces the importance and necessity for this facility, devoting an entire tractate to the mikveh and the laws of immersion." The caves in which the purification baths were found were "caves of refuge," where Jews who lived in the area sought shelter under Roman rule, particularly during the Jewish revolt that ended with the destruction of the Second Temple. According to Shivtiel, the effort needed to build mikvehs under such difficult circumstances indicates that these cave dwellers were probably kohanim. "These people saw it as an imperative to build a mikveh in their shelter, in a cave on a steep cliff," he said. Three of the mikvehs on the cliffs were documented by archaeologist Ronny Reich of Hebrew University, but Shivtiel and Boslov discovered two more. Other findings that they and others have uncovered in the Arbel region show that these cave dwellers lived at subsistance level and in crowded conditions. They had water, food and light, as evidenced by the water-storage pits, niches for candles, and remnants of cooking pots and pitchers, but no more than that. Shivtiel, who consulted with rabbis to identify the mikvehs, said they were distinguished from other water cisterns by three things: steps heading into the bath, a water supply from a natural source and enough water to immerse one's entire body. "Preparing a mikveh is beyond what is needed to sustain life," Shivtiel said. "The Jewish group most likely to see it as an integral part of their lives would be a group that was part of the mishmarot kehuna [priests who did shifts at the Temple]." Previous research has shown that when the priests found refuge in the Galilee after the destruction of the Second Temple, at least one group moved to Arbel.